Mesomorphs have a genetic advantage because they have the ability to gain muscle and burn fat easily compared to ectomorphs and endomorphs. 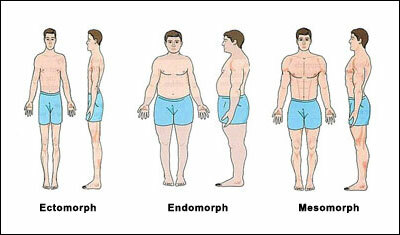 Many of the professional bodybuilders fall into the classification of being Mesomorphs. The following nutritional recommendations will further help mesomorphs maximize lean muscle growth and fat loss. Mesomorphs can determine how many calories they need to eat per day to maintain their current body weight by multiplying current body weight by 15 (therefore, a 210 lb. person needs 3,150 calories daily). On a macronutrient level, mesomorphs should aim to eat a diet that is 40 to 50 percent carbohydrate (carbs), 30 to 40 percent protein, and 20 percent fat. 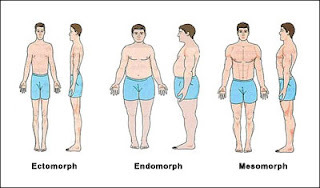 Mesomorphs looking to gain weight and build lean muscle mass fast must take in more calories each day than their body needs to maintain their current body weight. This is true even on days that they do not exercise. Mesomorphs looking to lose weight can take in slightly fewer than their maintenance calories, while making adjustments to the types of food they eat and their training. To gain lean muscle mass, mesomorphs should shoot to increase the amount of protein they take in. Aim for 1g per pound of body weight. Additionally, lower the total amount of simple fast digesting carbs and try to consume more low-glycemic complex carbs such as beans, all nuts, whole wheat bread and pastas, brown rice, sweet potatoes and yams. Consuming more slow-digesting carbs will keep insulin levels stable so that most of the weight you gain will be lean muscle mass, rather than stored body fat. The only time a mesomorph should eat high-glycemic fast-digesting carbs is with their protein after an intense workout. Mesomorphs looking to lose body fat as they build muscle should strive to eat smaller meals more frequently. This will cause you to feel fuller and that will help prevent you from binging and will also help keep insulin levels stable. If you consume big meals at infrequent times this will cause insulin levels to spike which will cause your body to store calories as fat. Also, when you do eat carbs, eat them only at specific meals, directly after training (post-workout) and at breakfast and before 2pm. At the remaining meals, carbs should be coming from green vegetables, fruits, beans and nuts instead of other complex carbohydrates such as brown rice, sweet potatoes, yams, whole wheat breads. If you do consume these carbs after 2pm the portion size should be smaller aim for about the size of the palm of your hand. For fat content, shoot for foods rich in the omega fatty acids 3, 6 and 9. These fatty acids can be found in whole foods such salmon, avocados and all nuts, flaxseed and olive oils. Even when trying to lose weight, your body still needs enough fat, particularly to make testosterone, which will not only help build muscle but burn fat as well.